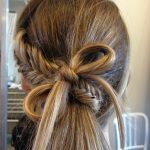 Home » Popular Hairstyles » Braid Hair Ideas: Cool Conch Shell Braid! Braid Hair Ideas: Cool Conch Shell Braid! This imaginative and unique braided chignon updo is perfect for making an unfussy fashion statement at work, or at any formal event! The head is an amazing mixture of beautifully blended asymmetric patterns, textures and shades which make it a totally eye-catching hair design. The hair is woven into an asymmetric, inside-out French plait which curves gracefully around the head, with the pattern cleverly emphasised by the dark-blonde highlights. Beneath this, a sophisticated and unusual chignon is created from coils of glossy, dark-blonde hair fixed in an off-centre position, above the nape. The final touch of casual trendiness is added by the loose wisps and spiky tips which contrast and soften the controlled patterns for a fabulous contemporary chic upstyle! This braided updo is best for summer!